June 2017 - Excel achieves a major milestone - 115 swimmers are officially registered with the club, including 2 boys. Thank you parents, swimmers and coaches for the trust you put in our club! Kia and Mary (13 to 15 swimmers) selected to represent Team Alberta over the summer . They will be coached by one of our 13 to 15 coaches – Elizabeth Scott. May 2017 - 90 Swimmers participate in the year end watershow. Private pool party followed by a BBQ celebrates a year full of accomplishments! July 2016 – Next season pre- registration indicates that Excel will have a 13 to 15 national stream team and a Junior national stream team representing the club for the first time in the National stream competitions. June 2016 - Excel achieves a major milestone - 75 swimmers are officially registered with the club, including 2 boys. Thank you parents, swimmers and coaches for the trust you put in our club! May 2016 - 48 swimmers participate on the year end watershow. - Excel’s top athlete is selected to swim at the Centre of Excellence in Montreal and to represent Canada on the Junior and Senior teams. Well done Gwen! - 13 to 15 Duet finishes first in the selection process to represent Zone 6 in the Alberta Winter Games. Well done Bethany and Paige! Excel hosts the Capital Figures Meet in conjunction with the Sports day in Canada. Events were attended by all regional clubs. Elise Marcotte was the Olympian who led the workshops for the Sports day event. 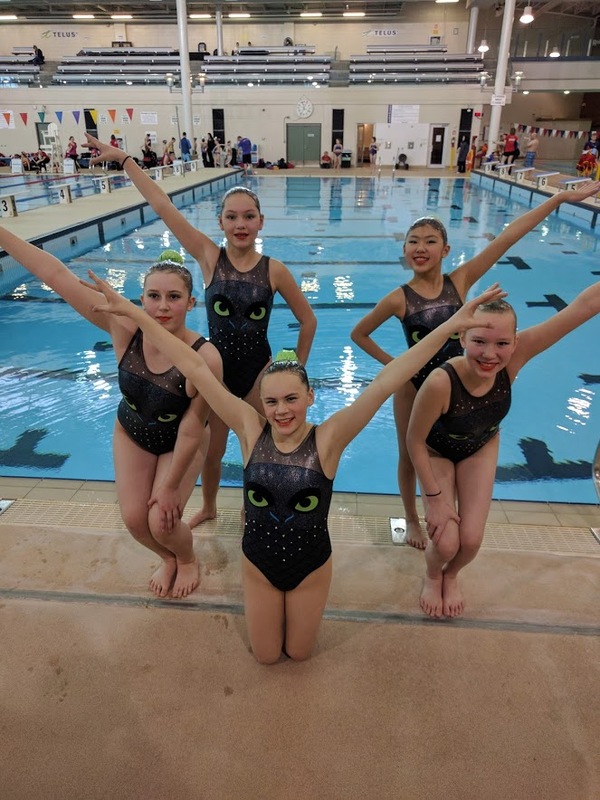 Club was selected to participate in Synchro Canada LTAD project. October 2015 – Excel is awarded 10,000 dollars to promote Physical Literacy in Edmonton and surrounding areas. The RBC learn to Play project is supported by RBC, Canadian Sport for Life, Participaction and Propel. August 2015 - Excel Swimmer Gwen wins a gold medal swimming for the Canadian Junior National "A" team (red team) at UANA Age Group Pan American Games, in Calgary. June 2015 - Excel achieves a major milestone - 50 swimmers are officially registered with the club! Thank you parents, swimmers and coaches for the trust you put in our club! Excel swimmers on the podium at the Prairie Invitational - Nikki first in Figuresand Solo (Routine and championship), Duet (Paige/Bethany) 5th place, Bethany 6th in Solo. March 2015 - For the first time in the history of the club a 10 & under and a 12 & under team represent Excel at a provincial competition. February 2015 - Gwen's solo places 3rd at the Canada Games. She also takes part in Team Alberta placing 2nd. August 2014 - Two time Brazilian Olympian swimmer Nayara comes to Edmonton to inspire our athletes during our summer camp. June 2014 - Three Excel National Juniors are named to the 2014 Junior Team Alberta. Head Coach Teresa also earns a berth on the team as Assistant Coach. May 2014 - All members of our Junior team achieve personal bests at COSSC Nationals with two of our athletes qualifying for National Team Trials. They are privileged to pre-swim the routine the final selections. We successfully defend our High Points Award Trophy at the Synchro Alberta Spring Trophy. Our athletes finish first and sixth in Junior figures, first and fourth in Junior solo, and first in Junior duet. March 2014 - National Stream athletes are featured in the promotional trailer for the 2014 Calgary Sled Festival. Our Junior team visits the Centre of Excellence in Montreal. They are able to work with coaches and athletes of Canada's Senior team. A fantastic inspirational opportunity! February 2014 - Three Excel Junior athletes qualify for the second phase of Canada Winter Game trials. November 2013 - We co-host the first annual Capital Figures Meet which is attended by all regional clubs. The highlight of the event is the visit by Gabrielle Brisson, member of the National Team. She speaks, performs and works with the girls during a fun-packed day. September 2013 - First Provincial Stream athlete joins club. We welcome Leduc Synchro to our programs. August 2013 - We host our first camp. It is well-attended by National Stream athletes. May 2013 - Excel's Junior Duet (Miranda/Arden) win first place at the Synchro Alberta Spring Trophy. 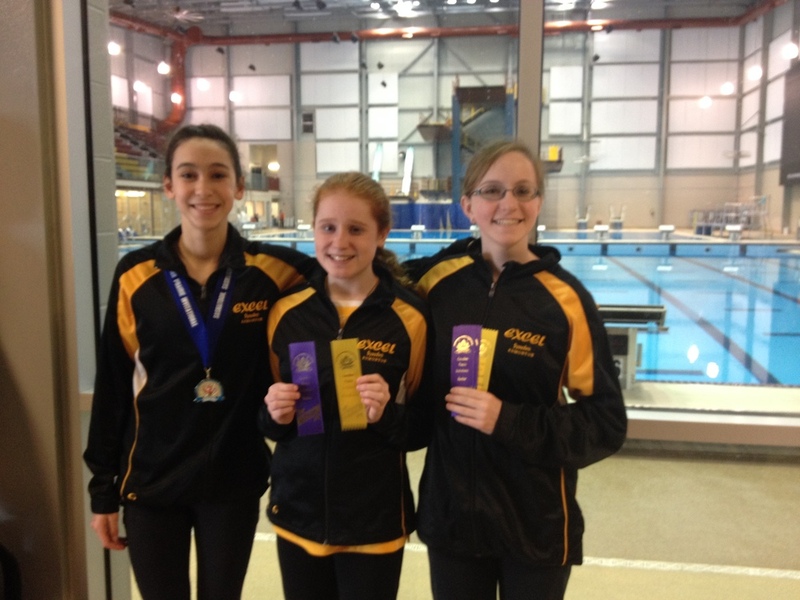 These swimmers placed first and second in figures. The club also won the High Point Award trophy, ending the season with great success. November 2012 Excel Synchro Club is established.